The Norstead Viking Site will take you back to the time when this was a Viking Port of Trade and the type of life that they lived in the Newfoundland region. A very interesting piece of history to explore when visiting Newfoundland and if you are there at the right time of year, you can view the pack ice floating in the harbour. Re-created huts and buildings at the Norstead Viking Site (a Viking Port of Trade) backdropped by pack ice in the harbour, Trails to the Vikings, Viking Trail, Great Northern Peninsula, Northern Peninsula, Newfoundland, Canada. 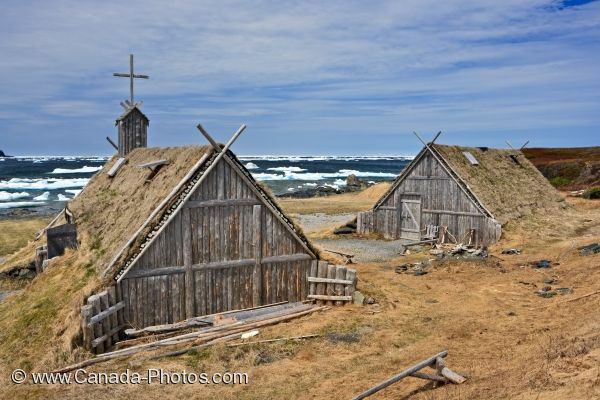 Picture of recreated huts and buildings of the Norstead Viking Site in Newfoundland, Canada with pack ice filling the harbour.